The boys/bucks at Misty Highland Farm are not set aside in some dark corner of the farm but are situated so they can also get the attention they deserve as they are 50% of our herd. Although at times during the year have somewhat of a "peculiar" odor and strange habits.....are friendly and attentions hogs nonetheless! We have chosen them for their genetics, personalities and overall dairy character and they have done well for us so far. We can't say enough about this nice boy. Always a perfect gentleman, Revellee passes his length of bone pattern, levelness of topline and tight shoulders and elbows to his kids. Most of his daughters have large capacious udders along with nice milk-able teats. He is just an over all nice dairy buck. Blue eyed Felix is built very much like his sire and has the quiet disposition along with nice long level topline we like to see in our bucks. Most of his offspring have improved general appearance over their dams and have nice milk-able mammaries as well. Beau is a sweet boy and is long, level and dairy with a very quiet disposition that fits right in with our other bucks. We have been pleased with his correct and very flashy offspring and look forward to his 2016 kid crop as we get him bred to some of the girls! He typically throws very unique and colorful offspring too so if you are looking for some flashy kids this boy is up to the task! 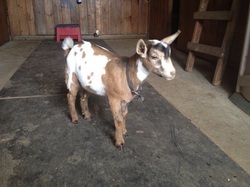 "GB" as he is affectionately called comes from our friends at Frog Hill Farm. He is on the larger side but is really a wonderful addition to our herd here. GB is long, level and wide with overall nice general appearance, balance and STRENGTH....along with that lovely light gold beard the girls just can't resist! Looking forward to seeing his kid crop next spring as we use him on some of our LaMancha girls to produce our second crop of Mini Manchas! He has two very nice mini mancha daughters on the ground here from spring of 2015 ...one we are retaining and the other going to a small homestead for family milk. "Nate" is here from Rebeka Acres ! We have enjoyed watching his dam Emily grow into a nice dairy doe and are pleased and excited to be adding this little guy to our herd. He is long and level with straight feet and legs and wide open ribbing. He is also extremely sweet natured! He has sired some outstanding kids for us in 2015 and we have retained two for our herd, Piper on the Nigerian Dwarf page and Genesis (Genny) one of our Mini Mancha doelings.